This bakery is where you go to truly feel like a local. Each day, my roommates and I grab a croissant here before class. The woman who works the front greets us each day with a, “buongiorno!” paired with the biggest smile. Italians love polite and respectful American students. If you make an effort to speak Italian, they will love it and help you. This bakery has delicious pastries as well as many different kinds of bread and sandwiches. I highly recommend stopping by. Il Rifrullo is right down the street from the bakery and there are always people hanging out here. 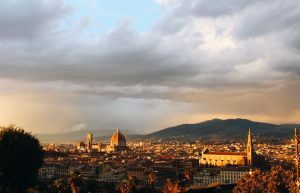 If you want to blend in with the local Italians, try going there for aperitivo. Aperitivo is before dinner where Italians sit down with a friend, have a drink, and have access to a buffet of delicious, authentic food. This is a great time to unwind before dinner and relax from a day of classes and walking around! This is one of the hidden treasures on this side of the river. 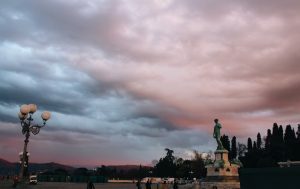 The hike up to the Piazzale Michelangelo is about 5-10 minutes which is not long, but it is steep. Definitely wear some walking shoes and head up to watch the sunset. 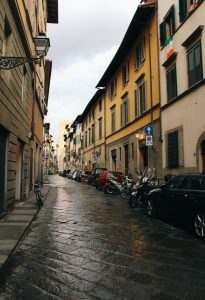 You will get the best view of Florence from here and some amazing pictures to send to your family & friends back home. It is also a great workout if you can’t make it to the gym! This gelateria is one of the best in Florence hands down! 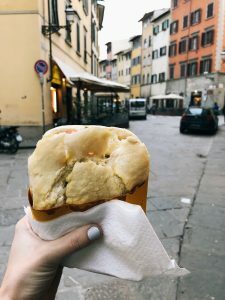 It is a must while you visit Florence since the gelato is real unlike many of the places around Florence that try to attract tourists. Here is a pro tip: the gelato that is piled high in the window is not authentic! That gelato is filled with preservatives and will not taste like the real thing. 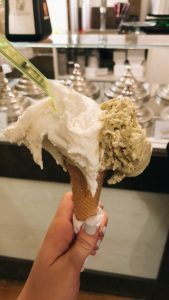 This gelateria creates their gelato fresh each day and they are constantly switching out the flavors, so you can try a new one each time you go. The woman who works there is also very sweet and will let you taste as many as you would like! Kristina is an SAI Florence spring 2019 student from the University of Kentucky.